Joy Creek Photo Archive (c) all rights reserved Lavandula 'Seal's Seven Oaks' is said to be the earliest lavender to bloom in the Pacific Northwest. 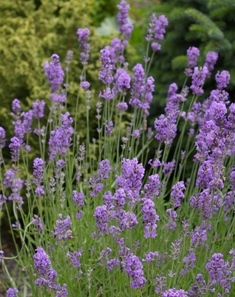 This very fragrant lavender blooms over a long period of time. Remove the spent blooms for a repeat in early fall. The gray green leaves are especially complementary to the violet flowers. June to September. 30 in. x 75 in. This is a cultivar of Lavandula angustifolia. Lavenders need full sun and very good drainage. Because of our rainy winters, we amend our soil with 1/4 ten gravel and top dress with the same to keep plant stems and foliage from resting on wet soil.